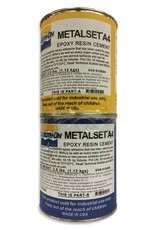 Metalset A4 is a powerful epoxy adhesive that has been used for years by all branches of the U.S. Military as well as every major airline and auto manufacturer in the world. A4 is used for hundreds of industrial bonding applications and offers excellent adhesion to porous or non-porous surfaces. It can be applied to vertical surfaces without sagging and cures overnight with negligible shrinking. Once cured, A4 offers good machining qualities (sanding, drilling, tapping), and resists alkalies, dilute acids and solvents. Applications include stopping leaks in pipes, valves and tanks (i.e. car gas tanks), bonding like and unlike surfaces, filling metal joints, dents, etc., anchoring bolts in wood, concrete, and repairing metal surfaces.